Saw a Tanjore painting at your friend’s house and wished you had one too? Walk into Kalaniketan and choose from a beautiful collection of paintings of all kinds. With three workshops in Kolkata, Kalaniketan has been in business since 1999. These pioneers of tanjore artworks have shops in Kankurgachi, Bhowanipore and Mani Sqaure. They deal with paintings of all kinds – whether you’re looking for portraits, oil paintings, glass paintings, or their forte, the gorgeous tanjore works, and come with a proud lifetime guarantee. They use 24 carat gold foil and different stones. Their works involve the popular clay Tanjore technique, and they also specialise in 3D Tanjore canvases. All their artists hail from our very own city but seem to have mastered this art of the South. Their oil paintings and glass works are also quite popular. Most of their work revolves around remarkable representations of different Hindu deities, especially Lord Krishna with his lover Radha. One particular Krishna canvas stood out to us with its gorgeous colours. 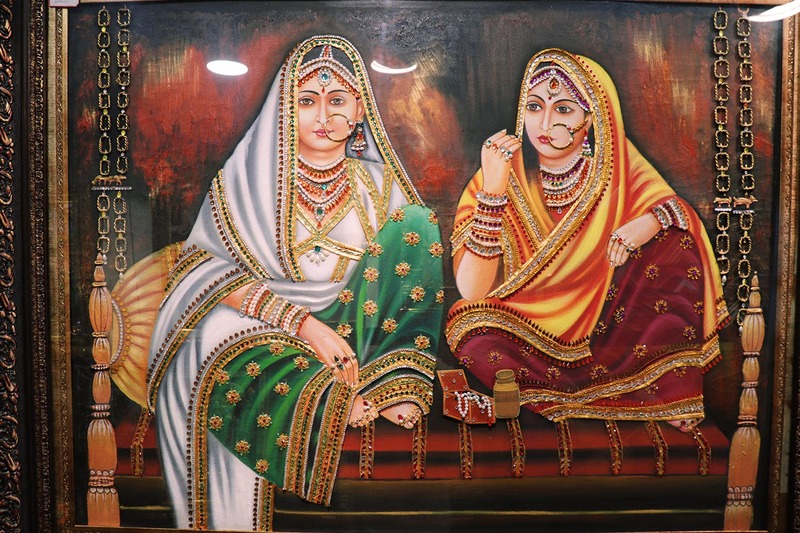 We also spotted quite a few paintings on Rajasthani men and women, some compositions of Tanjore. These gifted artisans also offer classes where you can learn their craft. Their paintings sell for INR 3,500 and above. They also take requests for personal designs, although they cost a little above the usual price.